He and Linda raised 4 kids while moving around to multiple cities during his journey. He led large sales teams for a multinational healthcare products firm – rising to become the Executive Vice President of Sales & Chief Marketing Officer at Invacare. This success journey did come with complications and complexity. That’s the way growing a family and career work. When Lou and Linda decided to retire, they wanted their next residence to embrace a new lifestyle for the ‘empty nester’ chapter of their lives. They wanted a simpler home. A place where they could focus on what really matters – family and friends. 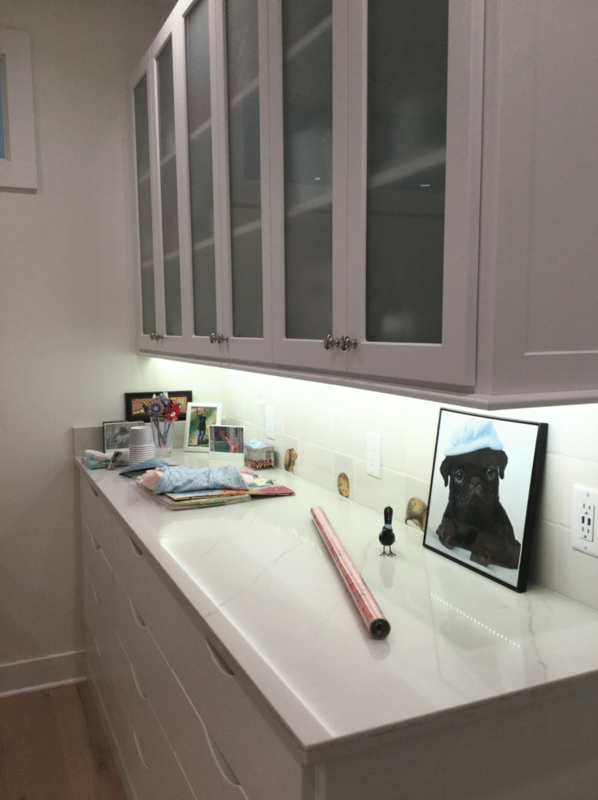 An organized, low maintenance space for an uncluttered life. A place where beauty would stand out. In short – they desired a ‘simply plain’ (yet sophisticated) home. The practical question was how (and where) to make this lifestyle a reality. In this article, I’m going to take you on a journey inside Lou and Linda’s ‘simply plain,’ yet sophisticated home. I’ll begin with their location of choice (the Bridge Park West Luxury Condos in Dublin Ohio developed by Crawford Hoying). Then I’ll move on to how they (along with help from their general contractor and home building consultant Todd West of Advanced Homes coming all the way from Grand Rapids Michigan to Columbus Ohio!) made it relaxed, refined, minimalist and magnificent. 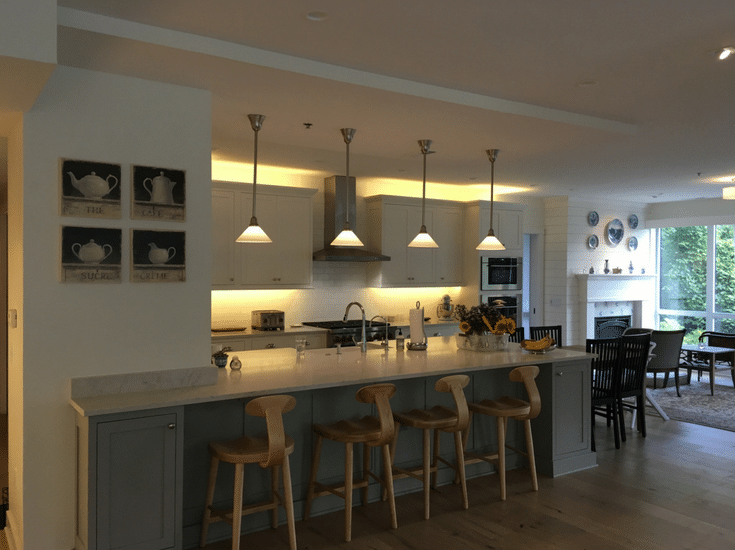 Have you ever seen a suburban home (complete with a 2-car garage) built inside an upscale high-rise condo complex? If you said no, neither did I. When you arrive at Lou and Linda’s home you’ll see a contemporary aluminum and glass enclosed first-floor entrance, but also be welcomed with the old-world elegance of a 18th century antique cabinet. The living room, dining room and kitchen are spacious, open and sleek. The long wood and metal sculptured dining room table is perfect to enjoy family time with the kids (and more importantly grandkids). 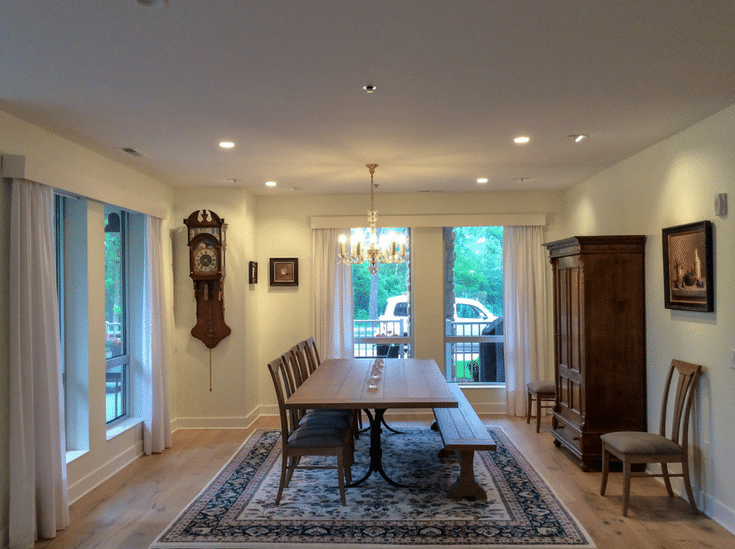 Lou and Linda’s dining room even has a view of the Olentangy River. As I mentioned before this high-rise condo has its own private garage with an elevator which takes you 5 flights up to a fine dining, casual restaurants, shopping and most importantly Jenni’s ice cream (or at least it would be most important to a guy like me who should be entering the 10-step Ice Cream Eaters Anonymous Program). This home captures an urban lifestyle with suburban home convenience within a luxury high rise condo. How cool! If you think of the words simply plain, you might mistakenly think, simply boring. However, nothing would be further from the truth in Lou and Linda’s home. In this article you’ll see a broader definition of simply plain. Simply plain is consistent and beautiful. Simply plain is neat, organized, uncluttered. Simply plain is thoughtful design in action. Simply plain lets you enjoy your home vs. becoming a slave to it. 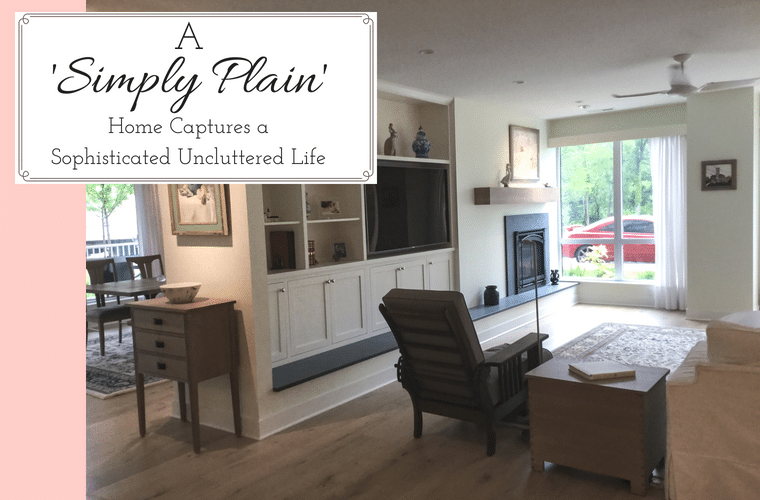 Let’s dig into why the simply plain home makes sense for a modern empty nester lifestyle. When your background color scheme and finishes are consistent you leave room for the eyes to focus on the beauty of your home (and beautiful pieces in it). Consistency was designed into this home. The walls are a consistent light beige. The doors, drawer pulls, and ceiling fans are the same throughout. This consistency allows beautiful things to stand out. 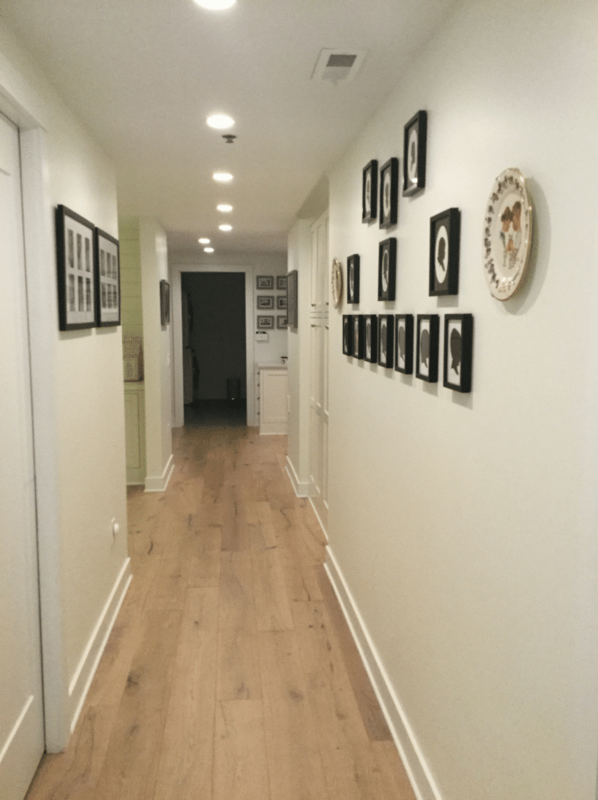 You can experience the beauty of a hallway of family photos in complimenting black frames. You can experience the beauty of a 18th century antique or a hand-made sculptured dining room table. Simply plain leaves room for beauty through consistency. Messy closets and pantries are frustrating and cause you to lose time digging for things. Efficient and effective storage makes getting ready in the morning or cooking a meal a joy vs. a chore. 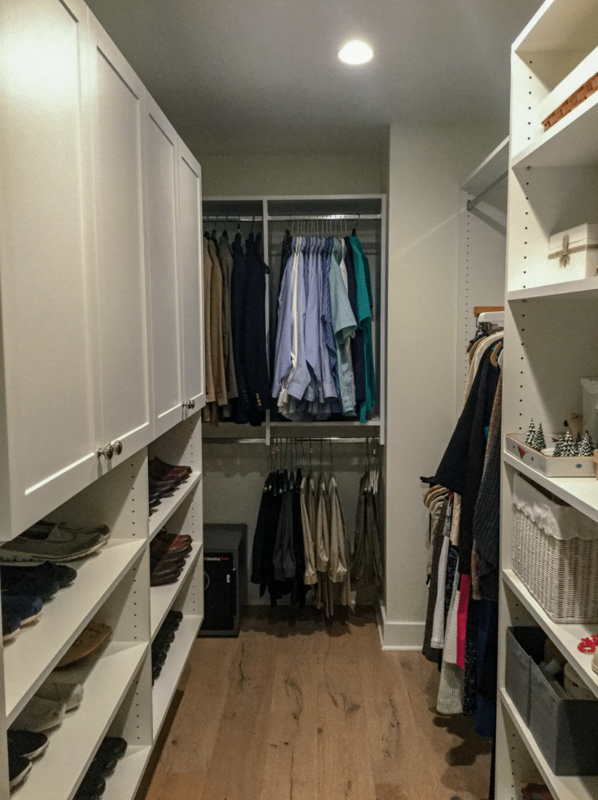 In Lou and Linda’s custom master closet they chose a simple wall mounted white closet system. It has a compartment for everything from shoes to suits to blouses and even Knick knacks. This wall-mounted closet design is minimalist and chic. It’s Shaker door fronts blend perfectly with the bedroom furniture. 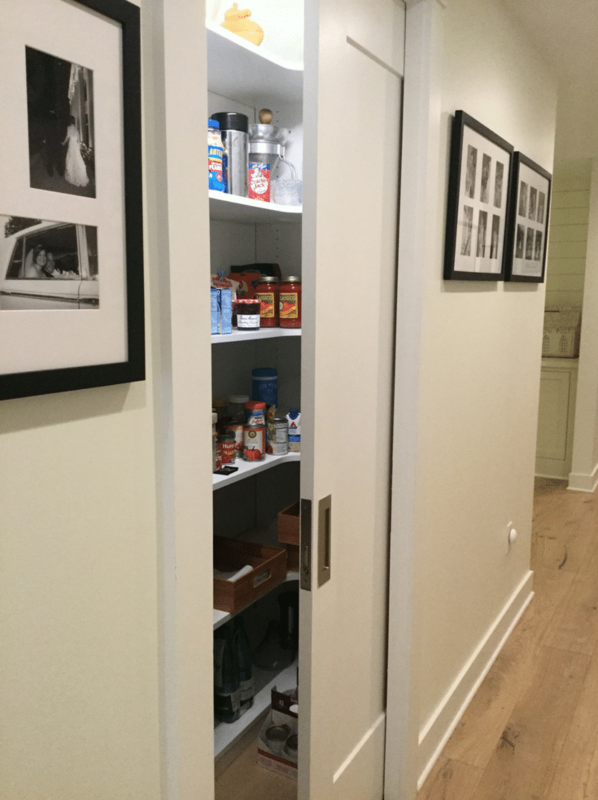 In the pantry closet of this Dublin Ohio home, it’s ‘U-shaped’ design makes finding cooking supplies and appliances a snap. The fact that the pantry shelves can be adjusted to different heights is an important bonus for more efficient storage. Thoughtful design helps us live smarter – whether it’s for our everyday lives or when we’re enjoying guests from out of town. A perfect example of this design philosophy is one of the ‘three bedrooms’ I’d call a ‘slash room.’ Not sure what a slash room is? It’s a room with multiple functions. In the Slagen home the ‘slash room’ is the 3rd bedroom. This space serves as Linda’s craft room 95% of the time and a guest bedroom the other 5%. 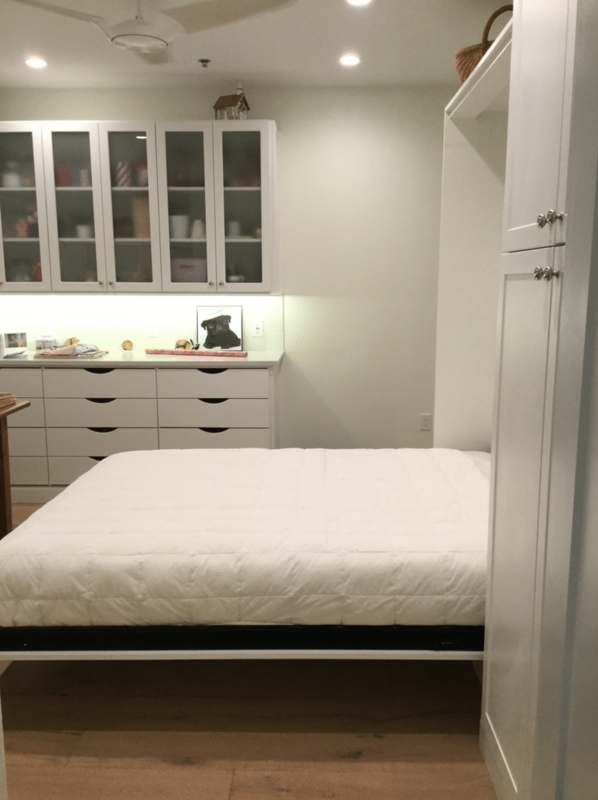 This multi-use room became practical with the use of a Murphy wall bed. This bed folds down when Lou and Linda’s kids and grandkids are in town. Since it has an 11” mattress it is much more comfortable than a sleeper sofa or a futon. The other 95% of the time the bed is hidden from view – giving Linda a large space for crafting. An adjoining bathroom makes this space very convenient and private for guests as well. This room is simply smart design in my book! Eventually the tile joints get dirty, or worse yet, moldy. Your builder is long gone – working on building their next home. You’re the one stuck with this maintenance hassle. Lou and Linda realized (from owning and maintaining several homes along the way), a simply plain home needed to be simple to maintain. A beautiful home should not be a chore. At this stage in life Lou and Linda’s goal was to enjoy their home, not be a slave to it. Making smarter material choices is one key to make this happen. One practical example of this was their choice to use grout free shower systems. 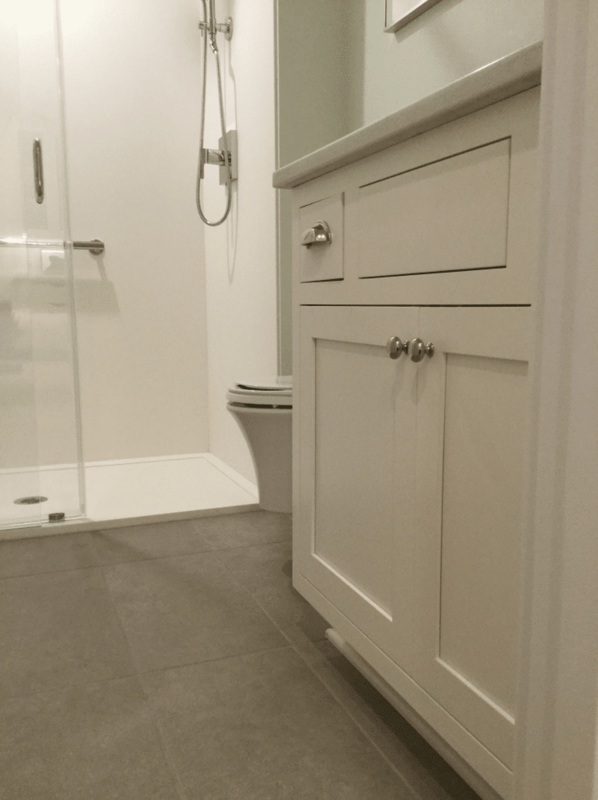 They used a matte finished solid surface shower pan and wall systems for both the custom-sized master bathroom and standard-sized guest bedroom. These bathrooms are no sweat to maintain (literally). They stay clean and neat. The best thing is ….no tile joints! If you’re getting close to the ‘empty nester’ stage of life (or just want a home which works for you and doesn’t cause you a lot of work) the ‘simply plain’ (yet relaxed and sophisticated) home is a perfect choice. If so, we would be glad to assist you. For help designing and installing home organization systems in Columbus you’ll want to call our Innovate Home Org division. For information, products and installation of low maintenance shower systems call our Innovate Building Solutions division at the numbers below. We’re looking forward to helping you like we did Lou and Linda. 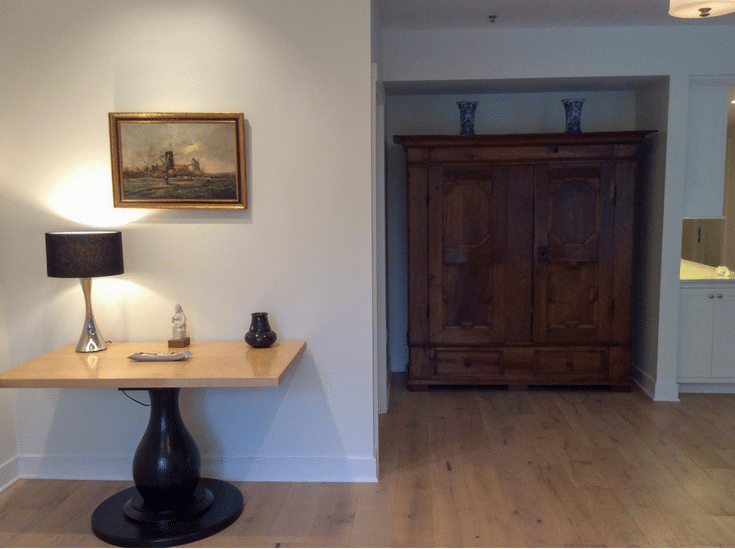 If you’d like to learn how to create simply plain (yet functional) closet, pantry, garage or Murphy bed solution and get a Free 3D design contact Innovate Home Org in Columbus at 614-545-6888 or in Cleveland at 216-658-1290. 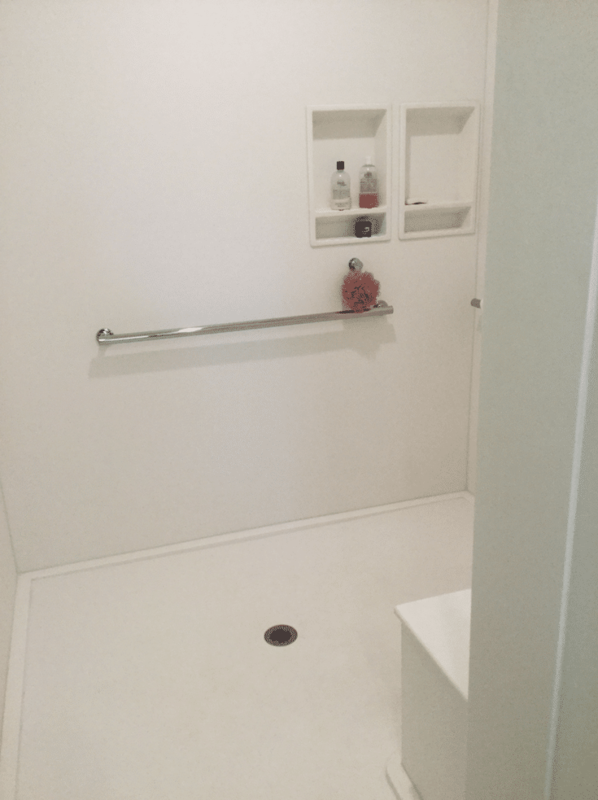 For nationwide supply and local Cleveland and Columbus installations of simply plain, low maintenance, high style bathroom products – like the solid surface shower discussed in this article – contact Innovate Building Solutions at 877-668-5888.